Making a new motorcycle is a delicate process. There are many needs to balance. There is, obviously, cost. But for a storied company like Royal Enfield, there is a pull of the past and the push into the future. There are the expectations of the faithful as well the hopes of the new riders. And all that has to sit within the borders that the brand and what it represents has created over time. You can push it, but the number of steps you can take is often limited. 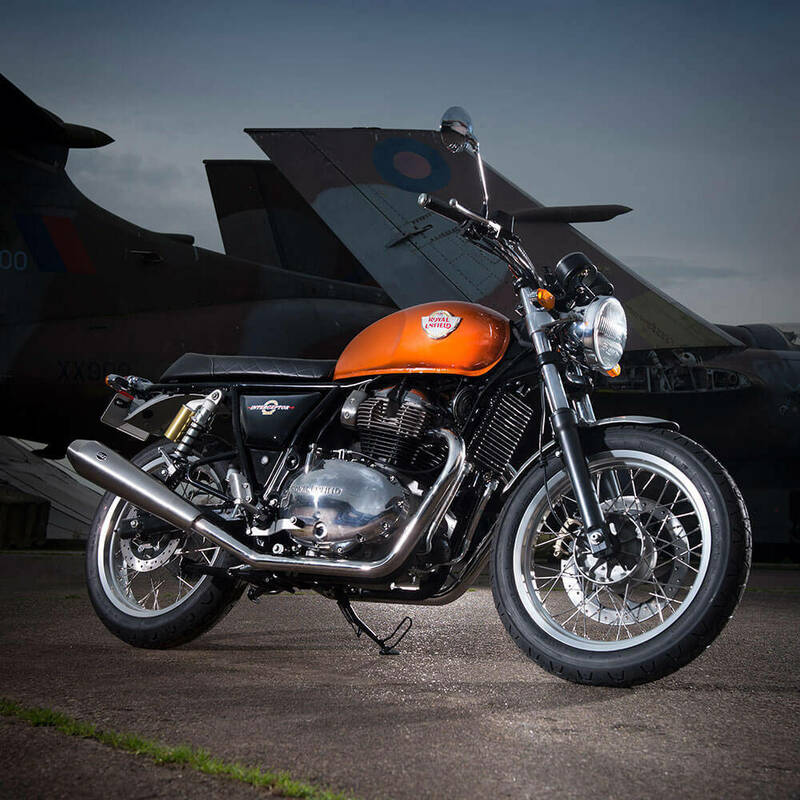 So could the Royal Enfield Interceptor 650 have been more powerful, or more sporty or a thousand different things? Of course. But this story is about what the Royal Enfield Interceptor is. Today. Well, in a couple of months time when it goes on sale, to be precise. The Royal Enfield 650cc Twin isn't something we're unfamiliar with, right? Not because we've ridden it already but because Royal Enfield revealed the engine and a lot of what makes it tick before the 2017 Milan Show in November last year. If you remember, the 650cc engine is all-new. It gets a four-valve SOHC valvetrain, oil-cooling and fuel injection. Nothing fancy here, so apart from ABS - standard - there's nothing to talk about. 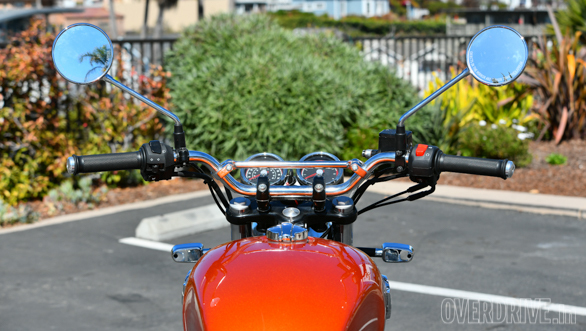 No ride-by-wire, no traction control and no riding modes. In fact, Royal Enfield has been clear that the performance targets for the Interceptor apart from hitting 160kmph - which led to a rise in displacement to 650cc during the development process - are modest. Modest, because the 650 Twins have to appeal to riders upgrading from 350 and 500 singles as well as other smaller motorcycles and too large a jump might be a bridge too far for them. The engine makes 52Nm at 5,250rpm but the torque curve is high and flat by design. As much as 80 per cent arrives by 2,500rpm, in fact. The peak horsepower is 47PS at 7,250rpm and the redline is set at 7,500rpm. The engine has a counterbalancer to quell any vibration and Royal Enfield tested and then chose a 270° firing order for character. That engine is mated to a new six-speed gearbox and final drive is chain. 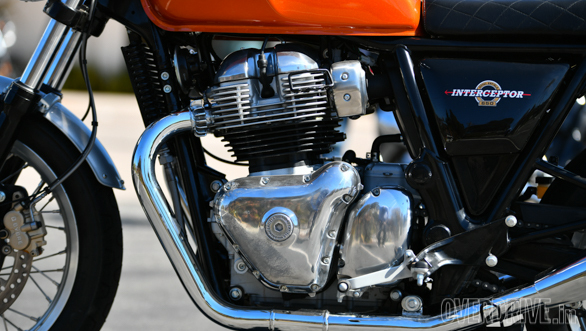 The engine and gearbox are shared between the Interceptor and the Continental GT 650. The Interceptor and the Continental GT also share the frame. It does look like the Continental GT 535's frame but it's completely new. The double cradle frame has removable downtubes - for easier access as well as production. 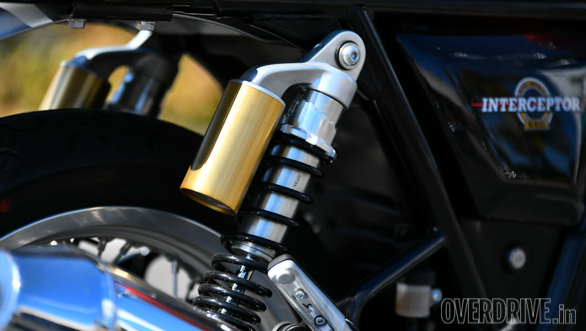 The suspension is 41mm (110mm travel) telescopic forks up front and pre-load adjustable gas-charged twin coil over dampers at the rear. 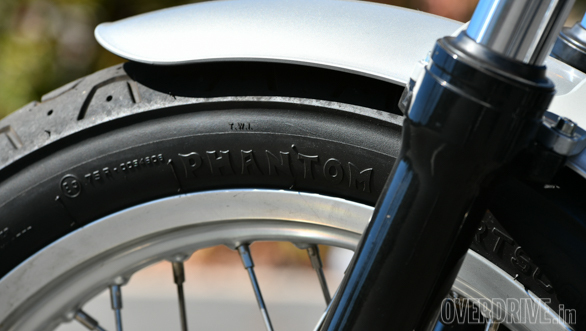 The Interceptor gets spoked aluminium rims with tubed Pirelli Phantom SportComp tyres. The ABS-equipped brakes are 320mm front disc by ByBre (sorry couldn't resist) and a matched, smaller disc at the back. The Interceptor runs 24°of rake, 106mm of trail and sits on a 1,400mm wheelbase. 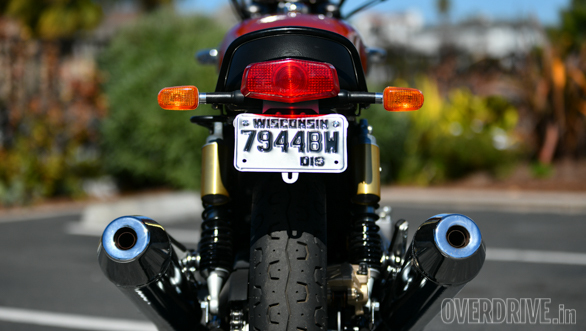 The Continental GT runs the same steering geometry numbers but a different rear preload setting means that when the rider sits down in the saddle, s/he experiences a slightly sharper motorcycle in feel. 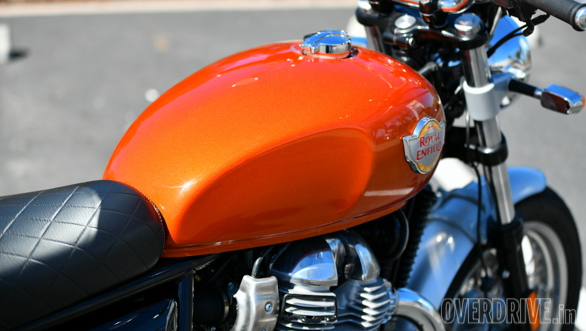 The Interceptor has a 13.7 litre fuel tank and Royal Enfield says 'kerb' weight is 202kg (198kg for the Continental GT 650) but that measurement is without fuel. So the actual kerb weight will be more like 210kg. Royal Enfield also clarified that the intention was to make one spec and that isn't just the frame or engine. There are exactly two models in production for the world and the only changes will be the small bits - like a front number plate - needed to meet local regulatory requirements. Inasmuch, the motorcycles that come to India, go to the US by January or hit other markets later on, will all be made to the same specification. The first thing you will notice is how smooth the new engine is. Vibration was the most popular question by far to OVERDRIVE about this bike and it's a valid one considering the kind of the machines Royal Enfield has made so far. But the thing to understand is that while the company has a clear idea about what its image is - nostalgic - this is a brand-new current day twin-cylinder engine designed for a specific performance and feel goal. The question of vibration doesn't arise. We rode the bike at slow speeds in low and high gear as well as upto something like 140kmph. There's barely any vibration to complain off. It isn't anaesthetic though - there is just enough vibration to let you know that there is a large engine running well. I rather liked the feel of the motorcycle. The burbly-rumbly stock exhaust helps no end. The 650 Twin sounds great. You can hear its thrum at low speeds in traffic and you can hear it rev out nicely too. Quiet California roads were enlivened to be sure. The second thing you will notice is how well the power delivery works. Because the Twin is wide awake by 2,500rpm and does it best work up to about 6,500rpm. The 1,000rpm on top are, um, there. But every time you hit the rather harsh redline and shift up, the sudden shove reminds you to stay in the sweet spot. And it's a wide sweet spot too. 100kmph in top gear is just 4,000rpm while 120kmph is a buttery-smooth 5,000rpm. I'd be happy to cruise at 130kmph on this and the engine - not a very strained state of tune in any case - feels calm, together and sorted. On one particularly quick section, an especially nutty development rider led into consistent 160kmph sweepers followe by blast to 180-something kmph, both indicated. 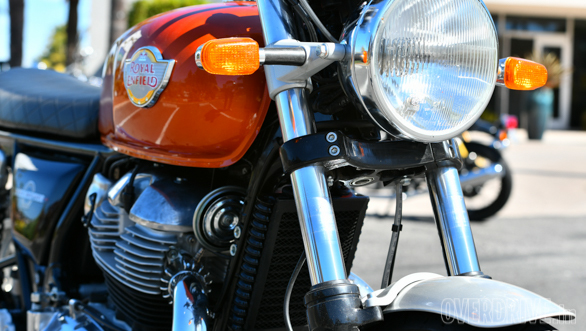 This was on the Continental GT 650, but its the same engine and gearbox so I think the experience should translate. The engine felt rock-solid and the torque flow is very enjoyable. The big surprise is a slick-shifting, effortless gearbox that makes playing the revs, or chilling in the sweetspot very easy to do indeed. It handles too! Royal Enfield hasn't chosen a particular aggressive dynamic package and I wouldn't call the Interceptor lazy either. It's accurate enough, flicks side to side quickly enough and allows you to easily tighten or fix bad lines mid-corner if you need to. I entirely failed to scrape pegs or any other hard parts on twisty roads and I rather enjoyed riding it in the South California canyons. What surprised me is the ride quality. 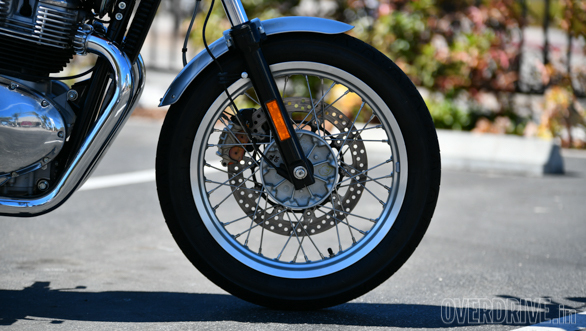 This is a slightly stiff motorcycle and this is on mildly bumpy California roads. It makes me wonder how this bike will feel on our roads. Royal Enfield says extensive testing has been done in India of course but I couldn't quite put my finger on the suspension's tune. There were bumps I felt that I wasn't expecting while others disappeared entirely. The brakes are very nicely tuned and the Pirelli's aren't designed for ultimate grip but are very planted and trustworthy. So that's a glowing report, no? I suspect that the seat will not be to everyone's liking. Some will find it a little narrow and others will find it a bit stiff after an hour or two in the saddle. But there's no doubt that Royal Enfield is taking a massive step forward on every possible front with the 650 Twin. It subscribes to the history of the company on many fronts but isn't constrained by the limits that places on engineering or materials. And the result is a well-made, robust feeling motorcycle that has adequate performance, great feel and is surprisingly smooth to boot. I'm very, very impressed and excited to ride it in India, it's home. And mine. 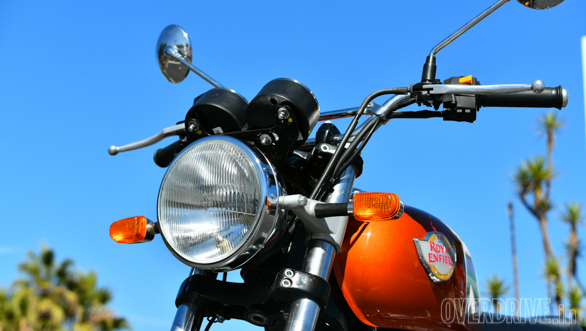 Royal Enfield hasn't decided a launch date but it looks like mid-November is a good bet. The motorcycle's price is the subject of massive speculation, of course. While I can easily see the Interceptor carry off a Rs 3.5 lakh ex-showroom price, Royal Enfield wants substantial mid-displacement volumes. A lot of the specification and engineering aims for this goal and I believe the final price will be a shocking sub Rs 3 lakh figure! That's unheard of value as multi-cylinder engines go in India, if true. Indeed, the US prices that were announced give credence to the idea that not only is Royal Enfield not afraid of the prospect of cannibalising the sales of their 500s, but that superb pricing was part of the design of the motorcycle - although there is hardly any thing on the motorcycle you can call out as cheap. But that price tag will allow the 3 million Enfield 350 and 500 owners to easily acquire and upgrade. 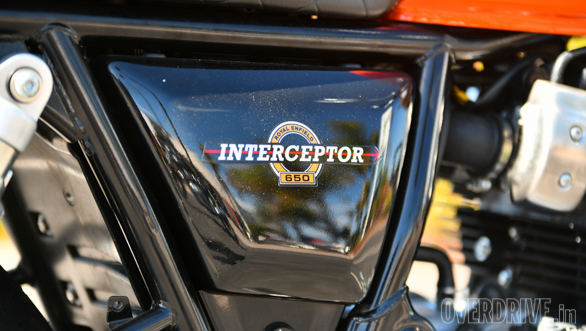 And that's what the Interceptor is. 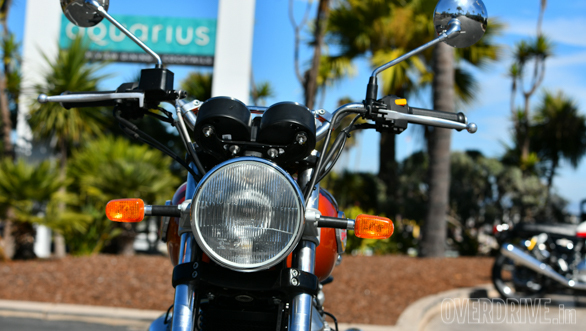 An extremely astute motorcycle that straddles the twin goals of being accessible to many and a motorcycle that brings Royal Enfield's refinement and quality levels at par with anything on the market today. Holy wow, that's a game changer!